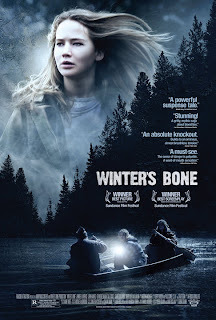 Home » Films » THEY’RE BACK and OZARK NOIR: Libby on THE GIRL WHO PLAYED WITH FIRE & WINTER’S BONE. THEY’RE BACK and OZARK NOIR: Libby on THE GIRL WHO PLAYED WITH FIRE & WINTER’S BONE. Occasionally author/film critic/bane of skunks and other assorted critters Libby Fischer Hellmann provides Crimespree with her thoughts on cinema. Today, she writes about a pair of crime films, both of which come from novels. If you’re a Stieg Larsson fan — and who isn’t? 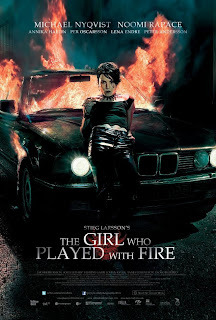 — you probably know that the Swedish version film of THE GIRL WHO PLAYED WITH FIRE is out. Lisbeth, Mikael, Erika, plus all the bad guys are back, circling around each other like tigers, waiting for the moment to strike. Lisbeth is again the silent but genius nerd, making herself as unappealing as possible. Mikael is compassionate, and Erika (who had practically no role in the first film) is mostly business. We’re not in a Swedish winter this time, but the setting is just as bleak. And the violence of the first film seems almost tame compared to the mayhem in this installment. If this sounds just a bit tongue in cheek, it’s supposed to. I wonder if it’s possible we’ve OD’d on the Larsson saga. Don’ t get me wrong, FIRE a good film. It’s as faithful to the book as the first (with minor nits), and it’s a more of a thriller, which is my favorite genre. This time, though, we know Lisbeth better. She’s not as enigmatic. We root for her anyway, and Noomi Rapace again proves she can inhabit a role perfectly. In fact, it’s going to be hard to see any other actress in her place. I was also glad the character of Erika Berger had more screen time. The contrast between Salander and Berger is dramatic. Add in Malin, the police officer, (who I hope gets more time in the third film), and you have three women who are strikingly different, but equally powerful in their own way. Still, I came out of the theater without feeling the pop or sizzle I felt with DRAGON TATTOO. Is it because we are already too familiar with the characters and the story? Or was it just that the film seemed – well –a tad too ordinary? Tough girl turns from victim to aggressor, goes after the bad guys, finds herself at death’s door, only to be saved when the cavalry arrives. You be the judge. Curiously, a film with similar themes, also adapted from a crime novel, did touch me in a visceral way. WINTER’S BONE, from Daniel Woodrell’s novel, is unspeakably dark, but it is also a beautiful film, and it is a must-see. It just may be one of the best adaptations since The Godfather. In WINTER’S BONE, Ree Dolly, like Lisbeth, is also searching for her father, although Ree’s search bears different fruit. The setting is perhaps bleaker than Sweden –the film takes us to the dirt poor, drug-infested backwoods of the Ozarks, where family income depends on meth labs and drug deals. The camera work was haunting, the acting suburb, but what I particularly liked was the film’s silence. The dialogue was spare, yet the camera lingered on the actors’ faces and the stark setting, creating a quiet eloquence and dignity you wouldn’t normally associate with the Ozark Noir. You really do have to see this film. Libby Fischer Hellmann’s 6th novel, DOUBLEBACK, a thriller, was released in October, 2009, by Bleak House Books. In it PI Georgia Davis is paired with video producer and single mother Ellie Foreman, the protagonist of Libby’s other 4-book series. Libby also writes short stories and edited the acclaimed CHICAGO BLUES. Originally from Washington DC, she has lived in Chicago for 30 years and finds the contrast between the beautiful and the profane in that city a crime writer’s paradise.